Emoticons are inherently silly. They're text based facial expressions that don't always make sense. Anytime a $ or # gets inserted to an emoticon, no one has any idea what the hell is going on anymore. But! When emoticons capture a feeling perfectly, they're beyond brilliant. A string of words can't even express life the same. So it's almost perfect that artist Butcher Billy has re-imagined iconic photos of celebrities with emoticons. He captures the facial expression in the picture with silly text combos. Albert Einstein sticking out his tongue? Obviously the classic tongue sticking out emoticon! Marilyn Monroe being sultry? A wink with a kissy face. And so on. 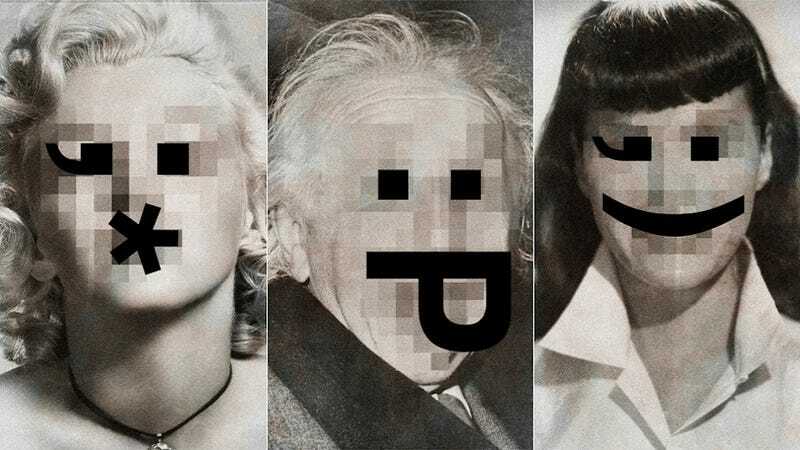 Some of the most seminal celebrities of all time get dragged, kicking and slyly winking, into the modern world of Internetal communication, with faces abbreviated to their most basic typographic expression.